Search for Mary Somerville in CBW. Find Mary Somerville on the Pop Chart. Mary Somerville was an outstanding mathematician and scientist of the Victorian period. Her scientific contributions were doubly significant: not only was she a woman working within a predominantly male domain, but modern science itself was a fledgling field struggling to claim a place in Victorian culture. Mary Somerville’s enlightened work helped to establish science as a distinct area of study in Britain, and by the time of her death she was well-known throughout Europe for both her prodigious mathematical talents and her modest, polite, zealously self-motivated personality. Curiously, Mary was not a proficient reader until her early teens, and encountered her first algebraic problem only by chance. Despite the many objections from those attempting to deter her, and entirely through her own efforts and determination, she became an internationally renowned authority on emerging sciences, including physics and geography. Mary Fairfax was born on December 26, 1780, not in her own home, but in that of her mother’s sister. Her father was a vice-admiral in the British Navy, sent to sea as a midshipman at scarcely ten years of age. As he was so often absent, Mary’s mother had decided to accompany him to his port of departure in London. In the throes of her confinement, Mary’s mother arrived at her sister’s house in Jedburgh, Scotland just in time to give birth to Mary. As Mary’s mother was ill following her delivery, she was nursed by her aunt Martha, who also happened to be the mother of her future husband (Neeley 23). Mary grew up in Fife, Scotland, in the “quiet, quaint little seaport village” (Osen 96) of Burntisland. The Fairfax house and garden were close to the seashore, and Mary spent much of her youth roaming the hillsides and coast near her home, practically ignorant of the existence of mathematics. She wrote in her autobiography: “I never cared for dolls, and had no one to play with me” (Somerville 18), and her solitary wanderings cultivated her profound fascination with nature. This lifelong love of nature was fueled by her devout faith in God, as her mother, according to Mary’s own account, “taught me to read the Bible, and to say my prayers morning and evening; otherwise she allowed me to grow up a wild creature” (Somerville 17). 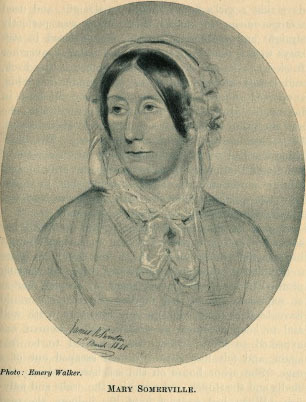 Her father, upon returning home from one of his long voyages, was dismayed to find her such a “savage,” hardly able to read or write at ten years of age, and he immediately sent her to a fashionable boarding school in Musselburgh (Osen 97), though Mary was “utterly wretched” there (Somerville 21) and only remained for one year. After her brief sojourn in formal education, Mary returned home to Burntisland and assumed control over her own education. She studied Latin, arithmetic, and writing, with only the aid of her own resourcefulness. In her mid-teens, the disapproval of her traditionally-minded family supplanted Mary’s ever-increasing appetite for education, and she was forced to spend more of her time learning domestic arts. She became quite proficient in playing piano, drawing, and needlework, and had an active social life. It was at a tea party that she encountered her very first algebra problem. Mary and a friend were flipping through a fashion magazine when she spotted some algebraic symbols that kindled her interest, and she resolved to investigate the subject further (Osen 99 – 100). Although unassertive by nature, Mary eventually managed to obtain and study a copy of Euclid’s Elements of Geometry despite familial reproach. Indeed, “her mother was appalled and shamed by such aberrant behavior, and the servants were instructed to confiscate Mary’s supply of candles so that she could not study at night” (Osen 102). In 1804, Mary married her cousin Samuel Greig, a captain in the Russian Navy. Though he had already served with distinction, Mary’s parents would not hear of her moving to Russia, so Samuel left active service and became the Russian consol for Britain in London (Patterson 3). Finally removed from the intellectual confines of her conservative family’s criticism, Mary was less inhibited in her mathematical studies, though not by much. In the words of her daughter Martha, “nothing can be more erroneous than the statement… that Mr. Greig (Mary's first husband) aided her in her mathematical and other pursuits. Nearly the contrary was the case. Mr. Greig took no interest in science or literature, and possessed in full the prejudice against learned women which was common at that time” (Somerville 3). Of the two children she had with Samuel, one died at the age of seven and the other, Woronzow Greig, grew up to be a barrister-at-law. After just three years of marriage, Samuel died in 1807, leaving Mary grief-stricken and unhealthy for several years. Not having found London particularly agreeable, Mary returned to Burntisland after her first husband's death. Financially independent for the first time in her life, Mary was at liberty to pursue her study of mathematics in earnest. Her interest in nature emboldened her and she also began to study astronomy and natural science. She continued to advance her scientific knowledge, slowly acquiring a small library as well as professional advice. In 1812 she married another cousin, a surgeon named William Somerville, with whom she had three children, though only two survived infancy. In contrast to the behavior of her first husband, Dr. William Somerville was entirely supportive of Mary’s efforts (Osen 105). In the early days of their marriage the couple divided their time between Scotland and London, and as their London residence was near the Royal Institution of Great Britain, Mary was able to use its vast resources to further educate herself. Dr. Somerville’s connections with the British government incorporated the Somervilles into an animatedly intellectual social circle, and Mary met and befriended many leading mathematicians and astronomers. Though she spent much of her day in private study, her daughter Martha wrote that Mary found “gay and cheerful company… a pleasant relaxation after a hard day’s work. My mother never introduced scientific or learned subjects into general conversation. When they were brought forward by others, she talked simply and naturally about them, without the slightest pretension to superior knowledge” (Somerville 5). The same humility with which her daughter credited her was reflected in her scientific work. Mary soon became well-known for her comprehensible writing style, despite the complexity of the subject matter, and for her desire to “make the laws by which the material world is governed, more familiar” (Osen 113). Mary’s first and greatest published work was her translation and introduction to Pierre-Simon Laplace’s Mecanique Céleste in 1831. Mary met with the great French mathematician and astronomer in Paris, and in conversation, he told her that “I write books that no one can read. There have been only three women who have understood me—yourself, Caroline Herschel, and a Mrs. Greig, of whom I have never been able to learn anything” (Chamber 186). Of course, Mary was the first and third of these individuals. Despite others’ confidence in her ability, Mary was hesitant and undertook the translation in secrecy in order to assure that her work could be destroyed if it were a failure (Osen 107). In her own modest words, she stated that “I simply translated Laplace’s work from algebra into common language.” The English scientist Sir John Herschel immediately proclaimed the work “a book for posterity” because of Mary’s ability to clearly communicate concepts through simple explications entirely lacking condescension (Mary 570). Upon publication, it became an extremely popular mathematical resource, and quickly became a textbook for Cambridge University mathematics students. Mary left England in 1833 due to the health of her husband William. They lived in various locations throughout the continent, mostly in Italy, but Mary was at a great disadvantage, no longer in the thick of the thriving, cutting-edge scientific community of London. She continued her research, however, and wrote a second book, On the Connexion of the Physical Sciences. It was first published in 1834 and was continually reprinted in several British and American editions. This second book was a detailed account of physical phenomena and the many connections among the fields of physical science (Grinstein and Campbell 212). In its first four decades, some fifteen thousand copies of her book were sold, and the tenth edition appeared in 1877, five years after her death (Patterson 193). The widespread acclaim garnered by her book did not go unrecognized, and Mary, along with Caroline Herschel, earned scientific distinction in 1835 as the first women elected as honorary members of the Royal Astronomical Society (Patterson 164). Mary’s humility, kindness, and work ethic did not diminish with time, regardless of her well-established reputation. Sir Francis Chantrey, a sculptor commissioned by the Royal Astronomical Society to sculpt Mary’s portrait bust, recalled a dinner party at which a friend begged Chantrey to introduce her to Mrs. Somerville. Chantrey seated the ladies side by side and perceived, from the ease of their conversation, that they were delighted with each other. He was later bewildered when his friend believed herself to be the victim of a joke, indignantly challenging him, “How could you do so? You knew that I did not want to know that Mrs. Somerville; I wanted to know the astronomer: that lady talked of the theatre, the opera, and common things” (Mary 569 – 70). In 1848, at the age of sixty-eight, Mary published yet another book, Physical Geography. The pioneering work proved to be yet another success, and Mary anticipated “a regional approach to geography rather than one made solely along national or political lines” (Patterson 194). It was used extensively in schools and universities for the next fifty years (Grinstein and Campbell 214), and five more editions appeared in her lifetime for a total of approximately sixteen thousand copies sold (Patterson 194). In her eighty-fifth year, Maryshowed no signs of slowing down, and she began her fourth work entitled On Molecular and Microscopic Science. It was published four years later in two volumes, the first delving into “small bodies of inanimate matter (molecules)” and the second dealing with “small bodies of animate matter (microscopic organisms)” (Patterson 194). By the time of its publication, however, much of its subject matter was already obsolete, and the reviewers paid more attention to her age and distinction than to the contents. At the seasoned age of eighty-nine, Mary’s mind was just as robust as ever and she pursued her last work, an autobiography in collaboration with her daughter Martha. Personal Recollections, published posthumously by her daughter, decidedly omitted distinctly scientific portions of the manuscript, in addition to specific references to people and events deemed uninteresting or inappropriate in context (Grinstein and Campbell 214). After the death of her second husband William in 1860, Mary spent the remainder of her days in Italy, with only a few brief visits to England and around Europe. Her old age was rather a forlorn time for her, not only due to the death of her beloved husband, but also because of the earth-shattering blow that came with the death of her middle-aged son Woronzow in 1865 (Patterson 194). In 1871, after the death of her close friend Sir John Herschel, she wrote that “few of my early friends now remain—I am nearly left alone” (Somerville 361). She became deaf and weak in her final years, though she continued nonetheless in her perpetual dedication to self-improvement. Her mind remained intact and she would “read books on the higher algebra for four or five hours in the morning, even to solve problems” (Perl 92). She died peacefully at the age of ninety-two, and up until the day she died she worked on math problems to amuse herself (Patterson 195). Mary Somerville’s dedication to knowledge and her everlasting love of nature pervades all the her works. In the words of her daughter Martha, “everything in nature spoke to her of that great God who created all things, the grand and sublimely beautiful as well as the exquisite loveliness of minute objects. Above all, in the laws which science unveils, step by step, she found ever renewed motives for the love and adoration of their Author and Sustainer” (Somerville 5). Chambers, Robert, and David Patrick, eds. Chamber’s Cyclopædia of English Literature. Philadelphia, J.B. Lippincott Co., 1904. Grinstein, Louise S., and Paul J. Campbell, eds. Women of Mathematics : A Bibliographic Sourcebook. New York: Greenwood P, 1987. Neeley, Kathryn A. Mary Somerville: Science, Illumination, and the Female Mind. Cambridge: Cambridge University Press, 2001. Osen, Lynn M. Women in Mathematics. Cambridge, MA: The MIT Press, 1974. Patterson, Elizabeth C. Mary Somerville and the Cultivation of Science, 1815-1840. New York: Springer, 1983. Perl, Teri. Math Equals: Biographies of Women Mathematicians + Related Activities. Menlo Park: Addison-Wesley Publishing Company, 1978. Somerville, Martha. Personal Recollections, From Early Life to Old Age, of Mary Somerville. Boston: Roberts Brothers, 1874. Kathryn Angelyn Neeley, Mary Somerville: Science, Illumination, and the Female Mind. Cambridge: Cambridge University Press, 2001. Kathryn A. Neeley's biography about Mary Somerville, which focuses on her professional work and legacy as a female scientist. Neeley structures her biography around Mary Somerville's published works. This Google Books preview of the text includes the author's preface. Maria Mitchell, "Mary Somerville." Atlantic Monthly. 5 (May 1860), 568-571. Maria Mitchell, America's first female astronomer, writes about mathematician Mary Somerville's achievements in the professional sphere. Mitchell also dicusses Somerville's working habits and her professional relationships. The article, originally printed in Atlantic Monthly, is linked through the Electronic Text Center at the University of Virginia Library website. Martha Somerville, Personal Recollections, from Early Life to Old Age, of Mary Somerville: With Selections from Her Correspondence. Boston: Roberts Brothers, 1874. A detailed memoir of the domestic life and scientific endeavours of Mary Somerville, written by her herself and edited by her daughter, Martha Somerville. Text includes personal anecdotes and excerpts from Mary Somerville's private and professional correspondence as well as a list of her published works. Full-text edition linked through Google Books. Mary R. S. Creese, "Somerville , Mary (1780–1872)." Oxford Dictionary of National Biography. Ed. H. C. G. Matthew and Brian Harrison. Oxford: OUP, 2004. Online ed. Ed. Lawrence Goldman. May 2009. Oxford Dictionary of National Biography entry on mathematician and scientist Mary Somerville written by Mary Creese. This comprehensive biographical record includes a list of other sources and archive materials related to Mary Somerville. Theodore W. Morse, "Mound City had The State's Oldest Library." Mound City Republic. 1941. Theodore W. Morse's article commemorating the 65th anniversary of the Mary Somerville Library, founded by a women's literary group (the Mary Somerville Library Society) in 1876. The article provides a background of the historical library located in Mound City, KS, including the significance of its name. Linked through the Mound City.org website. Shane Wood, "Biographies of Women in Mathematics: Mary Fairfax Somerville." Agnes Scott College, 1995. Shane Wood's concise biographical entry about Mary Somerville from the Agnes Scott College website. Wood's biography focuses on her work in the field of mathematics. The webpage entry also provides a list of references and links to other internet sources about Mary Somerville, including the full-text of M. T. Bruck's article "Mary Somerville: Mathematician and Astronomer of Underused Talents" (1996) from the Journal of the British Astronomical Association.